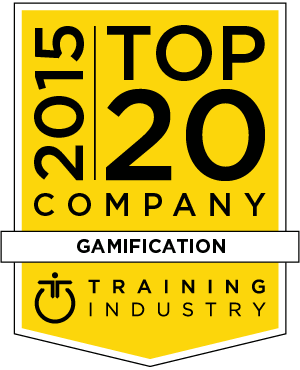 TrainingIndustry.com continuously monitors the training marketplace looking for the best providers of gamification services/technologies in support of corporate learning and development. This second annual list is designed to help buy-side organizations in their searches for the right gamification training partners. Due to the diversity of services included in gamification, no attempt is made to rank the top companies. Saffron Interactive creates personalized and behavioral e-learning that holds a conversation with the learner, addresses genuine concerns, and gives learners tools they can apply. The e-learning experiences combine animations, diagnostics, in-depth scenarios, simulations, serious games, take-away toolkits and existing resources. Paradigm amplifies the business acumen and strategic alignment of leaders, managers, employees and sales teams to achieve real business results. Paradigm's games, simulations and Discovery Maps® empower learning and development leaders to revolutionize their organizations. Profitability L&D has business simulations covering dozens of industries, and can offer them off-the-shelf, tailored to learning outcomes, or built from scratch for specific needs. Profitability L&D works towards business outcomes, by achieving learning objectives and supporting the embedding and application of learning on the job. Designing Digitally, Inc. specializes in creating educational, engaging and entertaining learning experiences that incorporate innovation, creativity and gamification to enhance learner retention. Designing Digitally offers a wide spectrum of solutions, including interactive e-learning, serious games, 3D training simulations, and mobile learning. NIIT is a market-leading, global managed training services company with over 35 years of experience in learning outsourcing. NIIT helps leading companies improve the effectiveness and efficiency of their training. GP Strategies Corp. is a global performance improvement solutions provider of training, e-learning solutions, management consulting and engineering services. GP Strategies' solutions improve the effectiveness of organizations by delivering innovative training, consulting and business improvement services customized to meet the specific needs of clients. Growth Engineering is a learning technologies company. It focuses on engaging learners with their training, and is a specialist is applying gamification to online learning programs. Its solutions include the Academy LMS, a gamified, social learning portal, and Genie, a game-based content authoring tool. IMC is a leading full-service provider for digital training. Experts in the areas of training strategy, learning technologies and e-learning content work together as one to provide holistic and tailor-made e-learning solutions. Gamelearn™ is offers skills training through video games and is a pioneer in the development of game-based learning solutions. Gamelearn™ has revolutionized corporate training by creating the 'game-based learning' platform, a market leader, and becoming a global solution for training and development departments. Performance Development Group (PDG) designs and builds learning modalities, including cutting-edge new technologies. PDG helps clients select, manage and get the most value from LMSs, learning portals, content management systems, social learning systems, and other technology tools. Axonify is a privately held software company that is changing the way corporate entities think about and deliver corporate learning. Using principles of interval reinforcement and incorporating the realities of how emerging workforces learn in today’s environment, Axonify enables its customers to make training stick and improve employee performance. G-Cube is a leading CMMi Level 3 e-learning products and services company with a global delivery and support footprint. Content services include designing and developing custom e-courses, mobile learning, content localization, game-based learning, simulations and consulting for curriculum design. "Enspire builds learning experiences designed to delight, educate, and change behavior. Enspire creates spaces for people to test what they have been taught, with all of the pressures of the real world, but without the consequences. SweetRush, Inc. incorporates solutions such as gaming, simulations, avatars, and more for training with the goal of increasing effectiveness and enhancing the learner’s brain. Whether gaming, interactions, interface design, video, or mobile design and development, the visuals are designed to accentuate and support learning. Cognizant is a global leader in business and technology services, helping clients bring the future of work to life. Cognizant's ability to conceptualize, architect and implement new and expanded capabilities allows clients to transform legacy models to take their business to the next level. TIS (MPS Interactive Systems) gamification solutions use game elements like points, badges and leaderboards to engage, inspire and motivate learners. Gamified solutions include gamified content, Serious Games, gamified platforms and their social gamification solution - QuizBiz. BreakAway is recognized as an industry leader in design, development and deployment of Serious Games. They are a full service studio with demonstrated expertise incorporating learning theory, human factors and cognitive engineering into a game created for education, training and assessment. Raytheon Professional Services (RPS) is a global leader in training services that help organizations drive workforce performance across the enterprise. RPS analyzes, designs, implements and manages customized and scalable training solutions to increase efficiency and effectiveness. The experts at Allen Communication solve business problems with custom learning solutions. They bring creativity into instructional design. They have built programs that impact companies by improving human performance. Allen Comm provides clients with made-to-order solutions and all of the benefits of an off-the-shelf SaaS solution. This second annual list is designed to help buy-side organizations in their searches for the right training partners. mLevel is a microlearning solution that produces effective learning outcomes by improving knowledge retention and skill application. mLevel helps learners elevate their knowledge and skills through an engaging learning experience that promotes rapid time to performance. MindOnSite is a leader in developing customized learning for online and offline modes. They assist organizations in implementing a complete and customized learning environment that offers a unified learning experience. They provide learning management and content creation software solutions for online and offline use. Expertus serves customers from offices in the US, Europe and India, and provides a full range of LMS consulting, training, implementation and support services to ensure smooth transitions from legacy systems, rapid technology deployment and sustained learning success. OnPoint Digital is an innovative technology services provider dedicated to the development and delivery of a new breed of employee learning and performance management tools for middle market and enterprise customers. OnPoint Digital’s platform offers a full-featured, fully integrated gamification engine. Trivie has developed an on-demand gamification platform based on brain science utilizing retrieval practice, micro-learning and adaptive learning to increase retention. This increased retention, coupled with higher engagement from gamification, enables companies to have higher sales, better customer service, and reduces overall training costs. The Wisetail LMS gives organizations the tools, flexibility and control they need to truly empower their learners and drive engagement. Its gamification capabilities increase learner engagement and knowledge retention using points, badges, leaderboards and user profiles. CrossKnowledge’s solutions enable workforce empowerment and global strategic alignment, providing a learning experience for the individual and ROI for the organization. CrossKnowledge offers a digital publishing system, Mohive, which allows organizations to create e-learning content by facilitating planning, authoring, quality assurance and publishing. CLD provides customized training solutions to leading companies. They offer games that reinforce knowledge in entertaining and competitive formats are our specialty. Single or multiplayer, online or offline. Customers can select from existing options or custom develop a game for a training initiative. Filament Games creates digital experiences that expand a player’s way of thinking. Their approach to game-based learning has the power to engage, inspire, motivate and educate. For the past 10 years, they’ve used this approach with partners worldwide to create 100+ digital learning games across every subject area and age group. Business Smart International designs, develops and delivers engaging and educational business games and simulations for management training. Its suite of games can be run entirely online or as part of a facilitated workshop or event. In addition to off-the-shelf games, Business Smart International develops bespoke simulations using its uniquely flexible platform.